The Tribeca Film Festival is a film festival that was founded in 2002 by Jane Rosenthal, Robert De Niro and Craig Hatkoff, reportedly in response to the September 11, 2001 attacks on the World Trade Center and the consequent loss of vitality in the TriBeCa neighborhood in Lower Manhattan; although there are reports that its founding was in the works prior to the events of 9/11. The mission of the festival is "to enable the international film community and the general public to experience the power of film by redefining the film festival experience." 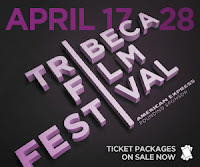 The Tribeca Film Festival was founded to celebrate New York City as a major film-making center and to contribute to the long-term recovery of lower Manhattan. Note: AT&T is making all screening tickets free on Friday, April 25. Beginning Monday April 14, reserve your FREE tickets at select AT&T stores and Festival Box Office outlets.